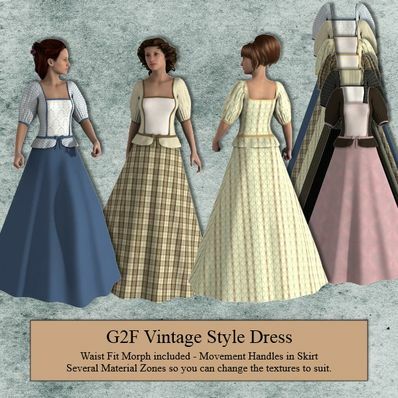 Vintage Style Dress for Genesis 2 Female for use in Daz Studio 4.6. I have to agree with meshme. These are such refreshing styles. I just love these dresses. Thank you for sharing and keep up the fantastic work! The Vintage Style Dress is gorgeous. Really appreciate all the MAT zones, you're awesome. Love the new site. Thanks for sharing your wonderful clothing. I have such fun with it. Congrats to you, your son and new website - it's a nicely done site. Tons of appreciation for all your effort and time put into creating all your wonderful creations. Thank you so much! Really wonderful Dress! This is a beautiful dress. I really love the top. Thank you, Wendy! The site is lovely, loads quickly and is easy to navigate. Give my congrats to your son, he's got talent. Now I need to "like" all your items :P! Congratulations to your nice and practical new website, and thank you for this wonderful new dress! Thank you, you have some marvellous creations. Good website. At last your new website! Congratulations ... and thank you for this lovely dress for G2F! thank you very much Wilmap for the new dress, and awesome website! a super logical layout, and black font on white, my eyes are thankful to no end! Thank you all, I shall pass on your comment to my son, who created and looks after the website. Nice new dress, neat website too - congratulations and thanks! Awesome. It's impressive to see all your creations in one place. You have a massive portfolio. Very nice website! It looks very elegant and easily navigated - and really love this beautiful dress with all the textures, thanks! The site seems very well laid out like all your creations, Thank you! Lovely website and a beautiful dress. what a nice surprise this morning. Thank you. Very nice website where everything is easy to find. All we like and waiting for is here. oh, nice. I'm liking the styles and controls. Thanks. Thank you RedMysticAngel and welcome to my new website.